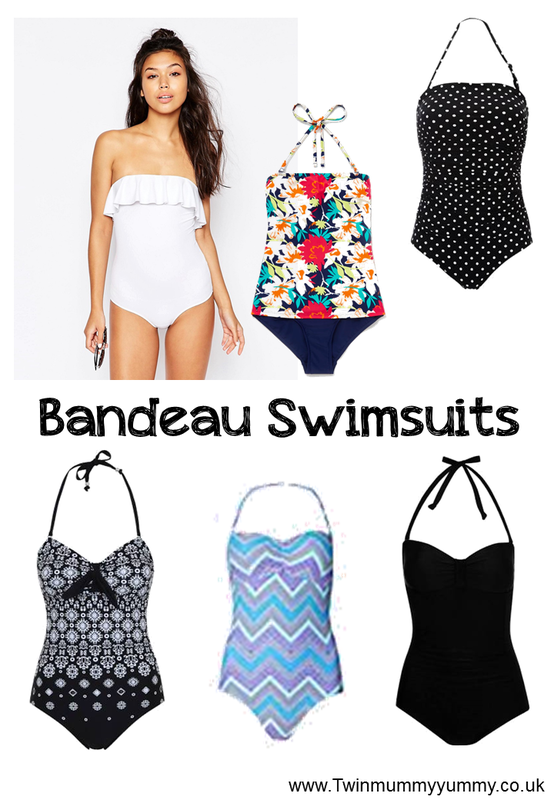 The bandeau swimsuit is a complete lifesaver if you are a mummy of toddlers. The thing I like the most about them is that you can run around after your child and still get a tan 'where it counts' without the dreaded tan lines. I've just come back from Majorca and I wore a black bandeau swimsuit while I was there. I never got the chance to lie on a sunbed once, with having two active toddler twins, but I came home with a nice tan and strap mark free. I loved how I could throw a pair of shorts over the top and walk around, if need be, and still not have those annoying strap marks, at the end of the day. Another reason why I prefer the swimsuit over a bikini, is that I am never still. Unless you can 'strike a pose' in your bikini, the look can be quite unflattering, especially if you have a 'mummy tummy', like me. I can chase after the monkeys, and keep my dignity intact. These bandeaus above would all be in my basket, but the white one is my favourite. I wonder if it's see-through though, when it gets wet? Not a good look. Which is your favourite suit?